The pace of hiring slackened in January following three months of outsize growth. New additions were made in a broad range of employment sectors and reduced the unemployment rate to its lowest level since early 2008. The performance of the job market, together with the new reading indicating the number of job openings are once again near an all-time high, buoys confidence in the ability of the economy to weather financial market turmoil. The U.S. labor market has overcome numerous obstacles to add jobs steadily since 2010, culminating in the addition of more than 5.7 million positions in the past two years combined. Eight of 10 private-employment sectors added workers last month, offsetting a loss of government positions to yield a net gain of 151,000 jobs. The U.S. housing market left an imprint on hiring trends. Building trades added 29,000 workers during the month to staff new residential projects. In addition, an expansion in manufacturing payrolls included nearly 5,000 hires in furniture making, and electrical equipment and appliances, industries with close ties to housing. Elsewhere, a gain of 58,000 retail positions accompanied store openings in new residential areas, while bars and restaurants contributed most of the increase in leisure and hospitality payrolls. Slack in the U.S. labor market continues to abate and spark wage growth. The unemployment rate slipped to 4.9 percent in January while the under-employment rate, a gauge of labor market tightness, was unchanged at 9.9 percent. Last month marked the fourth consecutive month with a reading in the under-employment rate below 10 percent, the longest such streak in nearly eight years. Greater employer competition to land new workers underpinned a rise in average hourly earnings, which have now increased 2.5 percent over the past 12 months. Wage growth in excess of the rate of inflation will stimulate real consumer spending gains and support economic growth in the coming months. The unemployment rate among individuals aged 20 years to 34 years plunged 60 basis points last month, to 6.0 percent. 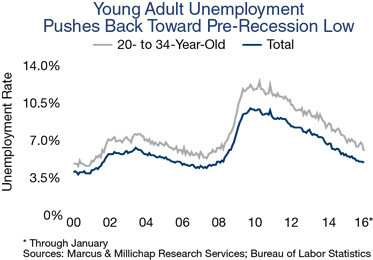 Most of the drop occurred in the 20- to 24-year old segment as those younger workers entered the workforce. The decrease in the unemployment rate in the so-called prime renter cohort will spur additional rental household formations in the coming months. This year, U.S. apartment vacancy will rise to a still-tight 4.2 percent as completions slightly outpace growth in rental housing demand. Roughly 285,000 new rentals will come online this year, primarily in 10 major metros. Professional and business services, and financial services payrolls continued to grow in January. Steady hiring by office-using tenants triggered workspace expansions and underpinned net absorption of more than 63 million square feet of office space in 2015, reducing the national vacancy rate to 15 percent. Further growth in office-using staffs will generate additional needs for larger layouts this year and support an additional drop to 14.7 percent. This entry was written by marcusmillichap, posted on February 12, 2016 at 3:56 pm, filed under Uncategorized. Bookmark the permalink. Follow any comments here with the RSS feed for this post. Post a comment or leave a trackback: Trackback URL.